UPSes can save your PC from disaster, but how do you know which will work best? Since we're living in the so-called developed world, a reliable mains supply is something we tend to take for granted. Yet many of us have discovered that it pays not to be lulled into a false sense of security. Mains spikes do occur in the UK, and the consequences can be fairly serious, ranging from loss of data to total equipment failure. Thankfully an imperfect supply isn't something we just have to accept. By investing in an uninterruptible power supply (UPS), you can protect yourself against most mains power problems – and it may not even cost as much as you'd think. The most obvious threat to the mains power supply is a blackout – a total loss of power. In many cases, this is short-lived and power will be restored automatically within a few seconds. However, when permanent damage has occurred or planned maintenance is taking place, the outage could last minutes or hours. A long blackout is inconvenient, but the consequences could be worse than that if you were using your PC. Depending on how recently you saved your work and how well your application is able to recover lost data, you might have to spend quite some time getting back to square one when power is restored. And because your PC won't have shut down properly when power was lost, there's a chance – albeit a mercifully slim one – of file corruption. Less common than blackouts are brownouts, where the supply voltage drops below its normal value of 240V. 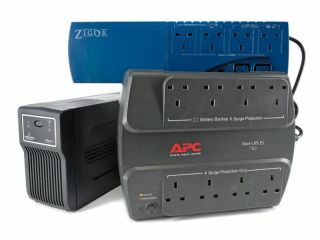 PC power supplies are fairly tolerant of low voltage, so, depending on its severity, you might get away with a brownout. The result could be the same as with a full outage, though. Less obvious but more common imperfections with the mains supply are spikes and surges. The two differ in their duration (a spike is fast, lasting around a millisecond, while a surge can last several fiftieths of a second) but both result in the supply voltage exceeding 240V, sometimes by a considerable margin. There's the potential here for serious permanent damage to PC hardware. Finally, it's important to recognise that telephone lines can also transmit spikes, often caused by nearby electrical storms, again with disastrous consequences. Thankfully, UPSes can protect against all these kinds of power fluctuation. In simple terms, a UPS is a unit that contains a large rechargeable battery that equipment can run off, allowing it to continue to operate in the event of a mains failure. They fall into three main categories – offline (sometimes called standby), line interactive and online (otherwise known as double conversion), and it's important to understand the differences. The simplest form of UPS is the offline design. Under normal conditions, any equipment plugged into one is powered directly from the mains, which also trickle-charges the battery. In the event of a mains failure, the battery provides power via an inverter that converts from the battery's low-voltage DC output to the 240V AV required by mains-powered equipment. Because an offline UPS provides no inherent protection from surges or spikes, filters are often included to provide some level of shielding from these threats. A line-interactive UPS is similar to an offline model, but with a twist. Whenever a mains supply is present, automatic voltage regulation is provided to produce 240V at the output. Except in extreme cases, this protects against brownouts or over-voltage and preserves battery life by not having to switch to battery power under low-voltage conditions. With an online UPS, power is always provided by the battery via an inverter. When mains power is present, the battery will be constantly topped up and during a power failure the battery will become progressively drained. The advantage of the online approach is that the equipment is always fully isolated from the mains supply and thus safe from surges and spikes. The downside is that the double power conversion (240V AC to low-voltage DC and back to 240V AC) is inefficient, so overall consumption of power is increased.